What Factor Is Driving Chesapeake’s Stock Rally? Is The Natural Gas Rally Sustainable? How Will The Natural Gas Glut Impact Chesapeake’s Valuation? Chesapeake Energy (NYSE:CHK) Chesapeake has been a controversial company, with the stock trading at historical lows during 2018. Since then it has rallied to $3.40 as oil prices recovered and the company’s outlook improved. We have a price estimate of $3.04 per share for Chesapeake Energy, which is higher than its current market price. 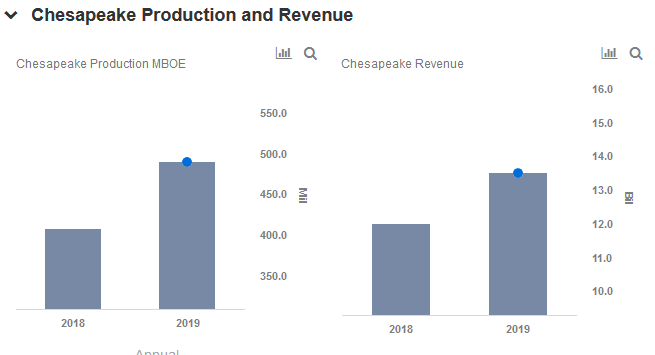 View our interactive dashboard – Chesapeake -2019– and modify the key drivers to visualize the impact on its valuation. 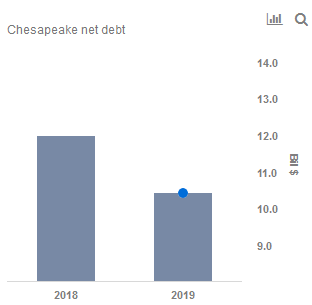 Chesapeake, which is saddled with debt, (although the debt is far below the $40 billion in debt in 2014 that almost led to its collapse), has seen some relief in recent times. This is a result of the management’s refinancing efforts, that has resulted in maturities being pushed out a couple of years. But these actions will also lead to the company having to contend with higher interest rates, and higher principal payments. Chesapeake also faces risks should the global economy face a recession going forward. The company expects that production will grow anywhere between 13-20% for the year. Oil is expected to average 44 MMbbls while Natural Gas production is expected to average 710 bcf. With total absolute rate of production expected to be around ~180 MMboe. The Eagle Ford shale, remains the backbone of Chesapeake’s operation, and will be the main source of growth for the company during the year. We expect that it will achieve an EBITDA margin of $15-16 per BOE, this is 15% above last year’s levels. Net debt is currently 2x EBITDA, this will decline as the year wears on. The company predicates its outlook on an average realized price of oil being around $58 per barrel for the year. Chesapeake continues to make investors wary as its portfolio is highly vulnerable to lower oil prices. With its break-even price for its oil assets at $40/bbl and drilling costs expected to fall by 30% for the year, we believe the company is likely to see improved cash flow during the year. More specifically, we believe Chesapeake will achieve FCF above $53 per barrel in 2019. High margin wells are key to Chesapeake’s fortunes. With Eagle Ford, Appalachia, and WildHorse being responsible for most of the production, 80% of Chesapeake wells drilled in 2019 will have a ‘high’ margin. Should Chesapeake continue to show discipline in its operations, and the price of oil remains steady for the year, we believe that the stock could potentially rise to $4 per share, but until there are clear signs of a turnaround, we have a price estimate of $3.04 per share.